Well, I made it all the way to Minnesota and am spending a few days at my friend Alecia's place in the woods next to Duluth. It's super quiet and I finally had a good nights sleep and got time today to develop some film and do some printing. I'm running out of prints to sell to keep Gilli gassed up and tomorrow is an event at which I hope to raise some more funds, so a print session was sorely needed. I will probably stay up pretty late trying to knock out at many images taken during this trip as possible. On the way here last night a rather exciting thing happened. I relied on my phone to lead me to lead me to the destination and ignored Alecia's warning and direction that she e-mailed me prior to me leaving Minneapolis... Bad move! I got slightly lost and decided to turn around on a two-lane highway while having Alecia on speaker. It was just after dark and I did not notice that the road was flanked by two rather deep ditches. I pulled the nose of the bus into some random driveway and tried to back up... The rear wheels slipped off the road and into the ditch and when I put the transmission in drive and gave it some gas nothing happened and I heard the tires spinning! I was STUCK! The situation was rather dire - in front of me was that driveway that I just turned out of with a ditch on either side, behind me was a ditch and I was blocking the entire two lanes of that dinky little road. Just to the left of me the road curved, so if anyone was coming around that bend and were going anywhere near the 55pmh speed limit they could have plowed right into the left side of The Photo Palace and then things would have been really ugly. Alecia got to hear a nice loud string of swear words as I was at first panicking, then revving the engine in hopes that Gilli would overcome the hill of the ditch plus the height of the pavement. After I realized the futility of my actions I decided to take a chance and back up a bit more and take that jump with a little momentum behind me. You can not imagine the relief I felt when that course of action worked and Gilli jumped out of that darn ditch and sprinted into the flats of the driveway. Not 5 seconds later there was indeed a car speeding around the corner, so I think I got out just in time. Had I been still blocking that road the car would have surely slammed right into the side of the bus. Upon close examination during the light of day I was happy to see that by some miracle Gilli's belly was undamaged. Moral of the story - never try to turn a 35ft vehicle around at night on a two-lane road with which you are not familiar with. Tomorrow is Hillfest - an annual community event for the hill-side part of Duluth. There will be games, bands, vendors and plenty of foot traffic. I am very happy to be involved in it and to have two parking spots reserved on the soon-to-be blocked off part of town. I hope to make some more connections and interest people in photography by providing them a quick tour of the darkroom and a walk-through of historic photographic processes. Speaking of historic processes. In the arsenal of The Photo Palace Bus there is now a modern-day daguerreotype! I spoke with Rob via e-mail and confirmed that I could post this image and tell the world about his incredible generosity. 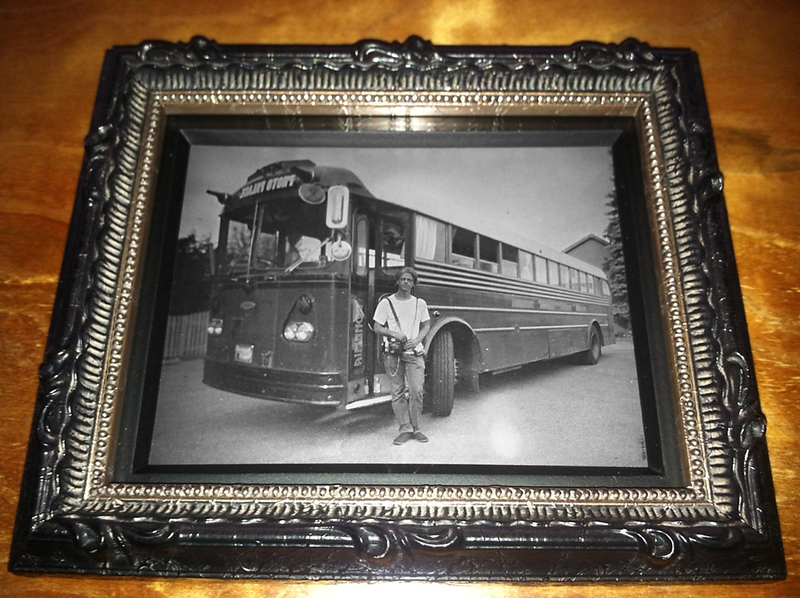 Not only did he give me a walk-through of making a daguerreotype image, but in the end he painstakingly finished and framed one of the two frames taken of The Bus and me and presented it to me as a gift! I was really floored. He stayed up until 4:30am doing this and I know for a fact that he has never ever given away one of these precious objects before. I guess we really did click and my passion for all vintage stuck a special note withing his big heart. I hope beyond hope that next time I'm in Buffalo I will be able to actually pay Rob a fair fee for a full hands-on workshop and produce a real daguerreotype all on my own. Moreover - I urge anyone who is interested in this historic an incredibly beautiful technique to do the same. You will not find a better, more devoted and clear-spoken teacher than Rob McElroy and I believe, whatever the fee is, it will be worth every penny. His technique is unparalleled and every step down to sealing the final image is thought through with utmost care. I an sorry for the keystone effect - this is the best copy I could produce in the field conditions. Daguerreotypes are extremely reflective and without a special rig it is impossible to take pictures of them head-on. When I get home to San Diego I will do my very best to get a better copy and post it here in replacement of what you see below. OK, back to the darkroom! So awesome to meet you today (glad I went with the hubby even tho I was not thrilled with being woken up Lol) ...keep up the good work and have fun at the festival.